9x12 inches. Ed. Wolfgang Birtel, fing./bowings: Friedemann Eichhorn. Pablo de Sarasate (1844-1908) is one of the most important and successful violin virtuosos of the second half of the 19th century and has become immortal through his virtuoso and highly expressive bravura pieces in the world of violin playing. His concert programme mostly consisted of his own compositions, even if quite a few works had been dedicated to him by fellow composers and tailor-made for him: for example, 'Symphonie espagnole' by Lalo, 'Scottish Fantasia' by Bruch and violin works by Saint-Saëns and Wieniawski. 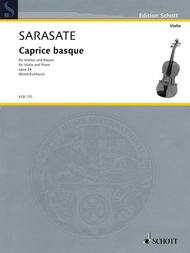 In 'Caprice Basque' (Capricho vasco) Op. 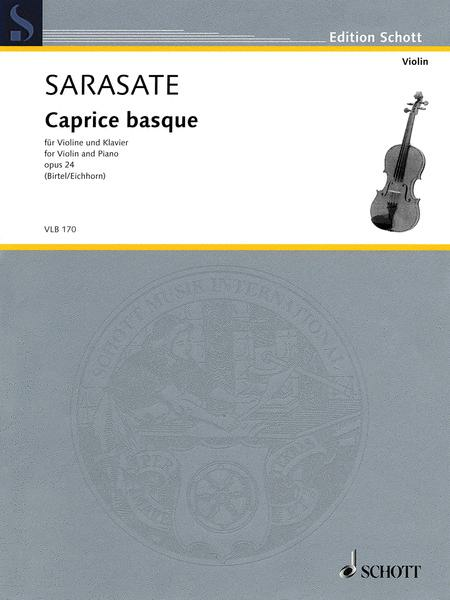 24, Sarasate used Spanish folk tunes. He dedicated this piece to the composer, conductor and pianist Otto Goldschmidt, a pupil of Mendelssohn. This work is influenced by the typically dotted rhythm of the 'zortzico', a Basque dance in 5/8 meter - a virtuoso and rousing piece for virtuosos.